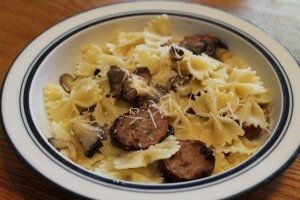 This Sweet Sausage and Oyster Mushroom Pasta is a quick and easy recipe that I made with few ingredients. This dish was inspired by some beautiful Italian Oyster Mushrooms that I was given when I toured my friend’s mushrooms farm, Mousam Valley Mushrooms. 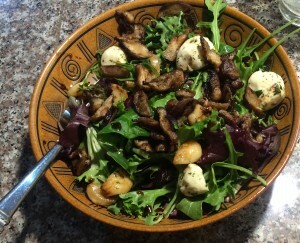 I kept this dish really simple because I wanted to really taste the mushrooms. The Italian Oyster Mushrooms were really meaty, which made this a hearty dish. Knowing that I wanted to make a pasta dish that highlighted the mushrooms, I went about deciding what to pair the mushrooms with. The folks over at Kayem (the makers of the Fenway Frank) asked if they could send me some sausage samples, and since my father loves Fenway Franks, I had the samples sent to Maine. My father manned the grilled and cooked up samples of 5 different sausage varieties, and when I tried the Sweet Sausage I knew that it would pair well with with the mushroom pasta dish I was planning. I used the leftover, already grilled, Sweet Sausage in this dish. I made this for lunch one afternoon and shared it with my father who gave it a thumbs up. The organic mushrooms tasted great after being simply sautéed, and the grilled sweet sausage had a nice flavor. I didn’t want to add anything but olive oil and Parmesan to this dish, sometimes keeping it simple is best. Bring a pot of water to a boil. 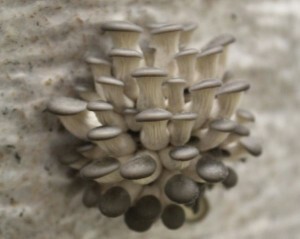 Meanwhile, chop the mushrooms, and slice the sausage into thin bit sized slices. Cook the pasta according to the directions on the box. While the pasta is cooking, heat 1 tablespoon of olive oil in a skillet over medium heat. Add the mushrooms, salt, and pepper and toss to combine. 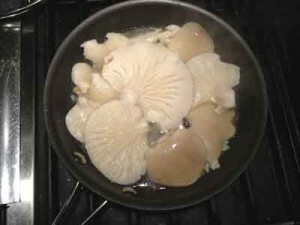 Sauté the mushrooms until slightly browned. Then add the sliced sausage and heat until warm. Drain the pasta and return it to the pot. Add the remaining olive oil, and the sautéed mushrooms and sausage, and the Parmesan. Stir and serve. The mushrooms were a gift from Mousam Valley Mushrooms, and the sausage was a gift from Kayem.